The Bistro Dugong, with its rich tastes, decadent desserts and charming atmosphere, is like no other restaurant on Okinawa. Reminiscent of a small French bistro, one can sit back, relax and enjoy a truly memorable dining experience without traveling far. Run by Chef Yoshio Hironaka and his wife, Dugong is located near Kadena AB, in Okinawa City. Bistro Dugong is at the top of the list for dinning out, and is also a recommended spot for a romantic evening. Whereas many chefs in Okinawa tend to alter some foods' original tastes to suit the palette of the local population, Chef Yoshio Hironaka has stayed true to his unique training. With the exception of using local vegetables, such as daikon, in his dishes, Hironaka stays away from the temptation and only creates authentic French cuisine. Trained in Paris, he worked as a chef there for 4 years. 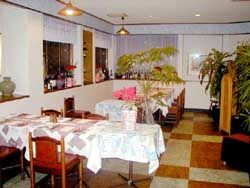 He opened his restaurant in Okinawa in 1982 and, for 18 years, it has been a most favored site for those craving for a taste of French food. One signature dish of the restaurant is the baked French Onion soup, featuring tender onions below crusty bread and cheese. Other tasty starters include the baked Escargots with Chablis and Herb Butter and the Duck Terrine. The main dishes are divided between two categories - Les Viandes (Meat Dishes) and Les Poissons (Fish/Seafood Dishes). For the meat lovers, the Bistro offers dishes such as Fillet Mignon with Black Pepper and Cognac Sauce or another favorite, Roasted Lamb with Rosemary Sauce, Garlic and Ratatouille. If a seafood dish is what you want, then try the Poached Lobster with vegetables and cream sauce, or the Sautéed Scallops with Saffron Sauce. Both of these dishes have a light cream sauce atop a tender seafood dish and both are favorites of mine. For the sweet tooth, the dessert could possibly be the grand finale of the exceptional dining experience. Chef Hironaka offers two distinctive desserts - Crème Caramel and Chocolate Mousse. Both desserts offer authentic tastes; similar to that of real French desserts, and the Chocolate Mousse is so delicate that it melts immediately upon entering your mouth. Because of the size and quality of the Bistro, one would expect the prices to be very high. In Tokyo, for example, such a restaurant would most likely cost a person close to ¥10,000 (about $100) per meal. But in this case, the prices are quite modest, especially considering the quality of the food and the service. There are three different sets that one can order: the Chef’s recommendation is a choice of appetizers, soup, meat or fish/seafood dish, salad and coffee or tea, for ¥3,500. If that seems like too much food for one person, try a smaller set, which includes all of the above except for an appetizer for ¥2000 (with soup of the day) or ¥2300 (with French Onion Soup). Another exceptional service of Bistro Dugong is that they allow their guests to bring wine into the restaurant. For a corking fee of 100 yen per person, you can enjoy your favorite bottle of wine without the usual high price you pay inside local restaurants. Bistro Dugong is open every day for lunch from 11:30 a.m. to 1:30 p.m. and dinner from 6:00 to 9:30 p.m., except for Tuesdays. For large groups or for weekends, reservations are recommended (please, call 098-936-4301). Directions: From Kadena Gate 1 take a left onto Hwy 58. Turn left on to Route 23 (before you reach Foster) and you will be heading towards Kadena Gate 5. Turn right at the Chatan Fire Station or right under the large green walkway (this is the same road where Yoshi Sushi is located). Just past the Ryukyus Bank, you will see the Bistro Dugong on the right.